The solution to Jewish cultural hegemony is nationalism. Nationalism is the historical idea that states are at their most efficient and the citizens of said states enjoy the best balance of security, freedom, and wealth distribution when the population is based on a common language and culture. Historically, it has been the most common form of statehood. Its opposite is globalism. Globalism is closely associated with empire and is a form of government that is structured to benefit elites. Its causes and effects are always to steal wealth from the people and redistribute it to the elites. It is, by definition, multi-cultural. Each of these groups has natural advantages and disadvantages as to whether or not they are suitable for providing the building blocks of talent and energy that is necessary to create the balance that humans desire, without creating a system so large that the individual is incapable of recognizing himself. Historically, families, clans, and tribes have proven too small to provide the critical mass of talent and developed skill-sets to produce the highest level of prosperity. On the other hand, the sub-racial, racial, and species groupings have proven too large and unwieldy, which combined with an associated loss of identity and purpose in the individual, leads to difficulty in creating healthy, well-balanced societies. Only the “Nation” grouping allows for the best balance of talent, skill-sets, and identity that in turn allows for the best balance of governance and freedom. After America’s Founding Fathers attended to the problem of establishing a government for their fledgling federation, they turned to the problem of populating and growing it. They understood the idea of nationalism, expressed above, and were concerned with how to increase the population of the federation. They decided to experiment with the idea of a racial nation based on all of the natural characteristics of a typical ethnic nation (i.e. a common language, religion, political system, legal system, system of weights & measures, etc.). All of the accoutrements of a natural ethnic culture extended to the racial extreme. Toward this end, they passed the Immigration Act of 1790, which made non-White immigration into the Union, illegal. Thus was White nationalism born. They never intended for this nation to be multi-racial or to have any religion other than Christianity (I do not profess to any religion), for they understood that attempting that would doom it. The experiment teetered and tottered for a while but ultimately proved to be successful. In fact, it got so bad that they had to pass another immigration act in 1924 to limit immigration to the percentages of the various ethnies that were already present in the country. 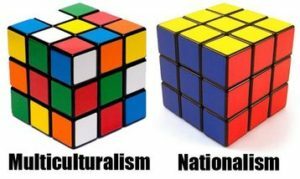 As mentioned, nationalist states are mono-cultural and mono-ethnic so nationalism equates to Ethnic nationalism. Because America is a nation of many ethnies, and those ethnies tend to coalesce into political groupings that are uber-ethnic, or racial, the normal desire for shared culture, traditions, folkways, and history becomes race based. Racial nationalism evolved from this desire. All races in America, except Whites — are not only allowed — but encouraged, to form race-based (or other identity-based) political organizations. This leaves Whites at a tremendous disadvantage in a society that increasingly founds social policy on identity. White nationalism is an organic movement to counter this disadvantage.